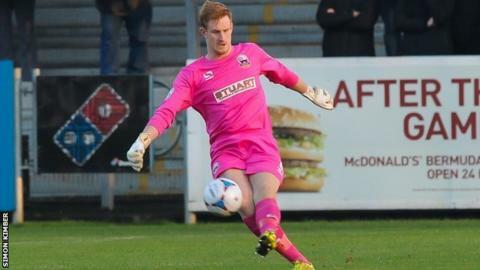 Nuneaton Town have re-signed Barnsley keeper Christian Dibble on loan. Dibble, 20, made five appearances for Boro following his initial arrival on loan in late November before being recalled by his parent club. He returns after Nuneaton brought in Shrewsbury Town's England Under-18 keeper Callum Burton on an emergency loan over the festive period. Boro have now used four keepers this season, Reice Charles-Cook, James Wren, Dibble and Burton. Then Boro boss Brian Reid began the season with Charles-Cook in goal following his loan from neighbours Coventry City. But he was recalled to Coventry in mid-November as cover when then Sky Blues' reserve keeper Lee Burge was sent off against Worcester City. Wren, who had already stood in when Charles-Cook himself was red-carded at Welling in early October, was then brought in by boss Liam Daish. But Wren was replaced by Dibble following a 5-0 defeat at Dover, having shipped 15 goals in five Conference games. The son of much-travelled former Manchester City and Wales keeper Andy Dibble, he joined Barnsley in July 2013 after leaving Bury. Nuneaton are 23rd in the Conference table, seven points adrift of safety, ahead of Sunday's home game against high-flying Bristol Rovers.